Sony Pictures Home Entertainment has announced an October 11, 2016 release date for the supernatural-comedy, Ghostbusters. Can a mod correct the title to 10/11/16? getting the UHD version for sure. edit: Can't wait for the GhostBros to chime in. Last edited by Dan; 08-30-16 at 11:32 PM. Why not? Most critics liked it and the studio needed to ensure that people are aware of it and that the backlash against the film was unjustified. Or you could, ya know - avoid the thread altogether and not thread-crap. Has a movie with a lower top critic rating (56%) ever put that logo on the cover? This is so destined for the $5 bins everywhere. Anybody buying it before that sure better be wanting to get some kind of exclusive. What kind of exclusive would justify buying this. None I can think of. The $22.96 price at Walmart and Sony including both 4K and 3D, made it worth a blind buy for me. Do the extra scenes in the extended cut actually turn this into a decent movie? A full size proton pack replica for the case? ^ but then women wouldn't be able to buy it and carry it out of the store (according to some folks). A 2 hour and 13 minute extended cut? Wow, that's quite a bit added back in. I didn't catch this in the theater after such lukewarm press and internet bitching. This was never something that I wanted to make a mad dash to the theater to see. But, I can rent the BD for $2 when it comes out, so I don't mind checking it out at home. This movie was a lot of fun. Will the home version use the same technique for the 3D that the theater did? For those who didn't see it, the film was projected in the 1.85 ratio and then letterboxed to 2.35. The 3D effects, i.e. 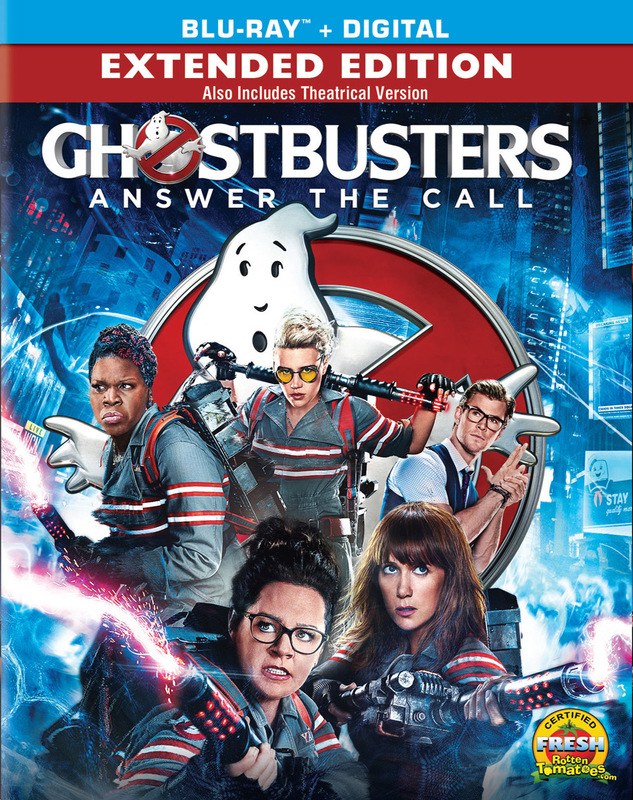 the proton pack streams, extended out of the film image into the black bars. It was clever and one of the rare times I felt that a movie was meant to be seen in 3D. 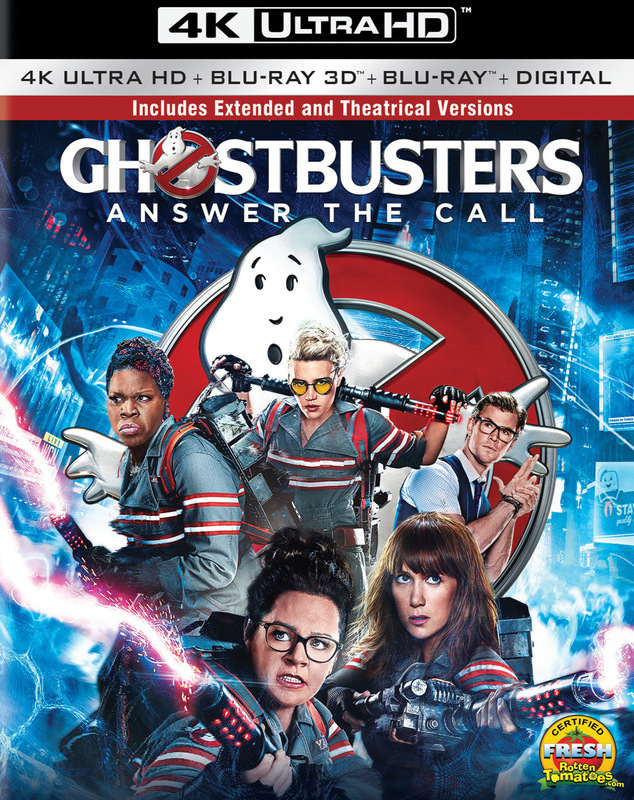 BTW, in the press release I got, it's titled Ghostbusters: Answer the Call. I never got to see it so I'll get the 4K version for sure. The movie wasn't great but I want to support the trend of packaging the 3D and 4K versions together so I already have it preordered. Wow. Compared to that, the Ghostbusters audience score of 57% seems almost respectable. To be fair, the movie had 35,000 votes and a 34% average before it opened, it'll never have an accurate "read" on audience response. Tales of Halloween wasn't that bad either, it was just intentionally really cheesy. Was never boring. It's not that cheap but man the Best Buy Steelbook is pretty and since it's got UHD + 3D BR together, I'll splurge the steep $29.99 asking price. ^^ At first glance it looks like four Captain Americas getting ready to battle ghosts. Did they actually print "(2016)" on the cover? Because that's pretty strange and I don't remember any remake ever doing that before.